Mag for your Ruger® Mini-14®, Let the lead fly! Super high after market quality, stainless steel Ruger Mini-14, Mag. Please Note: Mags may be curved or straight. Stainless steel. Sorry no choice. 4 Ruger Mini-14 30-rd. Mags, SS is rated 3.6 out of 5 by 13. Rated 1 out of 5 by N5PN_TX from Unusable, but clean and shiny, pieces of junk Just arrived today, two of the four mags will not lock into my Mini-14. The other two that do, are hard to remove. Believe it has to do with the retaining land on the rear end of the magazine. Although clean on the outside, the rough tooling marks and lack of precision indicate that this was probably made in the back of someones smelly and small workshop in a third-world country. Tried to load pics but this site would not let me -- keep getting this message: "An error occurred. Please try again. "The lands that should snap into place under the mag release lever are somehow attached with a spot weld process, and applied to the mag body cattywhumpus. Machine marks on these lands looks like a hand-held grinder. Hope SG will refund my money. Rated 1 out of 5 by Tom H from SS Mags Mini 14 3 out of 4 locked in rifle .Haven't tried loaded mag in the rifle yet. Rated 5 out of 5 by saintraidr from Quality Product I ordered 6-20's and 6-30's. The stainless mags are the perfect complement to my ruger mini-g stainless. Most mags fitted well, some others needed a little filing but no problem. 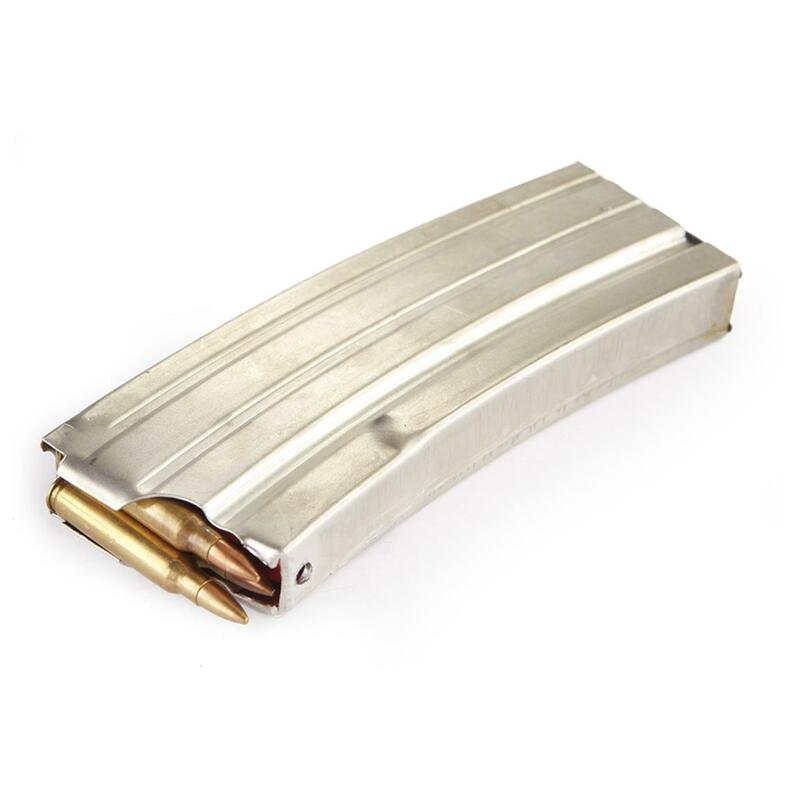 Rated 4 out of 5 by thomas from great price have not fired any rounds through the mags yet. but I have loaded them. they seem to be fine great service from sportsmans guide. Rated 1 out of 5 by Bob 413 from JUNK... Save your money... These mags ARE NOT stainless steel. They appear to be chrome or nickel plated.They had rust leaking out of the seams when I removed them out of the bags that they came in. They don't function reliably. Like a fool I thought I could get these to work, by cleaning & lubing. NOT!!!. Save your money. Shop around. Rated 1 out of 5 by GARY from Product is poorly built. Did not want to lock into my firearm. Sent these back. Easy to grip, easy to identify when it counts.